In light of the positive responses from our MILAB Experiencer Round Table and Symposium Discussion (7/25/015) via RISE Multiversity, we decided it would be a good idea to create an interactive video-conferencing online support group for experiencers of anomalous trauma. Because anomalous trauma can create post traumatic stress and in many cases, social isolation due to the high strangeness of these experiences, finding support in a concrete interpersonal way is rare. We may be able to attend conferences, view various YouTube videos, radio shows and internet forums, but the real interpersonal support aspect is missing or too costly. 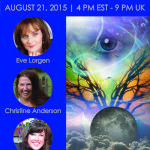 Eve Lorgen (anomalous trauma counselor, author, researcher), Laura Leon (Experiencer and Holographic Kinetics practitioner, multidimensional seer) and Christine Anderson (Co-founder of Earth Empaths, former moderator on Avalon forum and empirical wisdom counselor) are offering to co-facilitate a support group for interested parties. Those who have had any kind of anomalous trauma such as alien/ET abduction, interferences, love bite, Dark Cupid relationship interference, spiritual warfare targeting, MILAB or MKUltra will benefit from participating. Understanding the deeper dynamics of “interdimensional interference” and how to deal with it when it happens in our life and relationships. For maximum effectiveness, a group with no more than 15 participants is suggested. Price is $35 US and we will be online from two to three hours. If you cannot afford the price please contact Evie or Christine to arrange for fair exchange. To register click here. (Scroll down to Pay PalDonation button and enter amount with note for AT Support Group. The Zoom link will be sent separately to each participant who is confirmed group participant. WORKING AS SOVEREIGNS WE WORK WITH HONOR ~ YOUR PARTICIPATION IS AN ACT OF TRUST. Please download zoom.us on to your computer prior to the meeting and become familiar with it. Thanks! In collaboration with Rise Multiversity we send our deepest gratitude. This entry was posted in Anomalous Trauma, News and tagged anomalous trauma support group by eve. Bookmark the permalink.